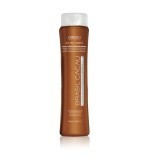 The Anti Frizz Shampoo cleans without damaging hair. Regnerates the inner and outer hair shaft, p.. The Anti Frizz Conditioner regenerates the inner and outer hair shaft, promoting a smoother and s.. The Hydrating Hair Complex Mask smoothes, restructures the hair shaft and reduces frizz. C.. 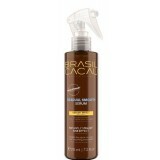 Apply Brasil Cacau Leave-in Primer to wet hair before styling. 0% Frizz Sun..